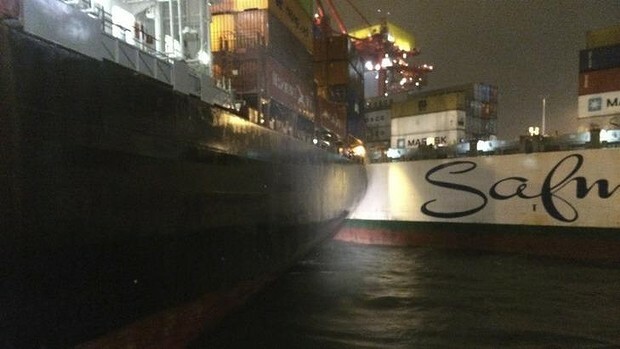 On October 14, The 292 meter long, 61407 dwt container ship Safmarine Makutu, the 276 meter long, 67637 dwt container ship OOCL Hong Kong and the 294 meter long, 65815 dwt container ship Kiel Express collided in Port Botany, Australia. The three vessels were berthed with standard mooring lines. 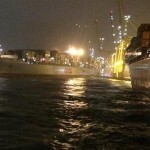 During the night, a severe storm struck the port with winds reaching 126 km per hour. The Kiel Express moorings snapped and was blown from its berth. 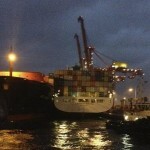 The Kiel Express cut the moorings of the OOCL Hong Kong allowing it to drift free as well. The OOCL Hong Kong sustained damage to its stern when it’s hull was punctured by the bollards on the quay. The Kiel Express continued to be pushed by the strong winds when it’s stern struck the Safmarine Makutu. The Kiel Express swung around and then collided side-to-side against the Makutu. Six tugboats responded to the situation and were eventually able to get all three container ships under control. 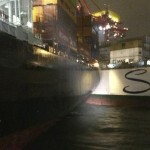 One tug became disabled by the loose mooring lines of the OOCL Hong Kong. No reports of injuries or pollution released. 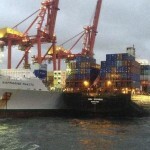 The Australian Maritime Safety Authority has launched an investigation into the incident.